Summer is coming, and Clementine is not ready. She is not ready to start speaking to her father again, because she's still mad at him for eating meat. Instead, she has to express her sadness by giving him drawings of animals she knows would not want to be somebody's dinner. Then there is the new baby on the way. Clementine's mom sure doesn't seem ready. She's suddenly crazy about cleaning (Dad says she is nesting), but she doesn't even have a name picked out yet. Clementine just hopes the baby won't be a dud. What Clementine really isn't ready for is saying good-bye to her third grade teacher. She knows Mr. D'Matz is going to tell her all kinds of things that aren't true. Everything else may be changing around her, but that doesn't mean that Clementine has. But which is worse, saying good-bye, or not saying good-bye? *"Give this to readers of Cleary and Blume and cross your fingers for more." *"Clementine is a true original. ? Libraries will need multiple copies of this one, because early chapter-book readers will jump at the chance to spend another eventful week with Clementine." 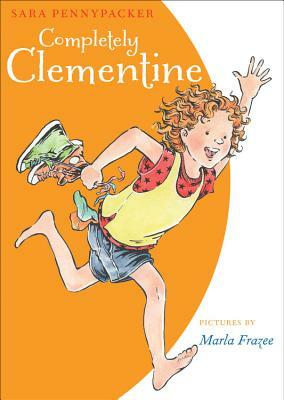 *"Pennypacker's writing once again brings creativity, humor, and sensitivity to Clementine and her world. Black-and-white line illustrations grace the book, capturing the child's personality and varied emotions. A must-have for most collections. Fans will be in for another fun serving of their favorite girl named after a fruit." *"Filled with familiar Clementine charm but, more importantly, a whole lot of heart, too." Sara Pennypacker (www.sarapennypacker.com) was a painter before becoming a writer, and she has two absolutely fabulous children who are now grown. She has written several books, including six previous Clementine stories: Clementine, The Talented Clementine, Clementine's Letter, Clementine, Friend of the Week, Clementine and the Family Meeting, and Clementine and the Spring Trip. Sara grew up in Massachusetts and now divides her time between Cape Cod and St. Petersburg, Florida. Marla Frazee (www.marlafrazee.com) illustrated all of the books in the Clementine series and several picture books, including God Got a Dog by Cynthia Rylant. She is the author/illustrator of The Boss Baby; Walk On! ; Santa Claus, the World's Number One Toy Expert; Roller Coaster, and Boot and Shoe. She is also a two time Caldecott Honoree, for All the World by Liz Garton Scanlon, and her own A Couple of Boys Have the Best Week Ever. Marla works in a small backyard cabin under an avocado tree in Pasadena, California. "Through it all, [Clementine] shines with a vibrant spirit that can never be completely extinguished, even when she is feeling down. Frazee's pen-and-ink drawings perfectly capture Clementine's personality and her world."